Less than a month left until Golden Afternoon 2017. Here's some most important information and answers to the frequently asked questions. 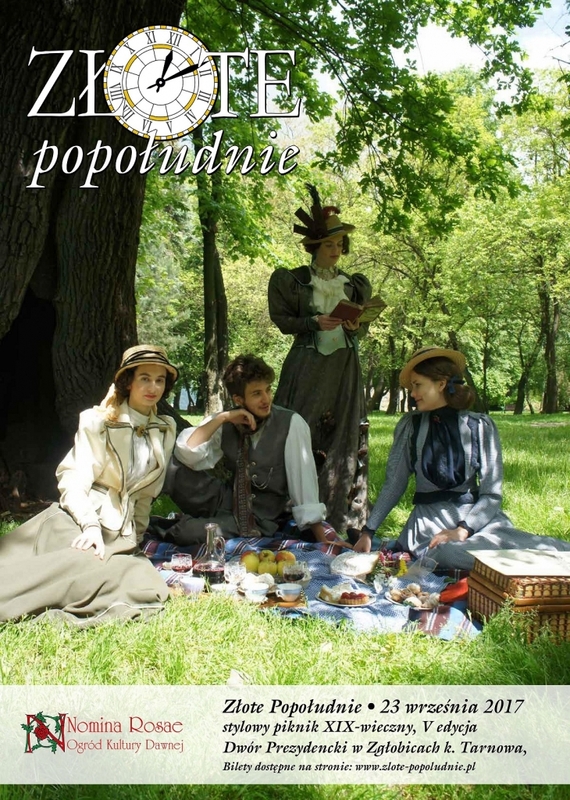 Golden Afternoon 2017, 5th srylish 19th-century picnic will take place on September 23rd in the Presidential Manor House in Zglobice next to Tarnów. Golden Afternoon is a meeting of the enthusiasts of 19th century – its history, culture and customs – but also for people, who are only now beginning their adventure with this era and want to get driven deeper in it. The idea behind the event is to popularize knowledge in a very open, inclusive way, we try not to make it hard for anyone to join and our dresscode is not strict; we want as much people to join us as possible, to make them catch the 19th century "virus" and join the community of 19th century lovers together with us. During Golden Afternoon we realize a programme including artistic, educational and popular-scientific events about the era. Where is the Manor House in Zgłobice? The Presidential Manor House in Zgłobice is located on the outskirts of Tarnów, some 80 km east from Kraków It's a 19th century complex that after being renovated houses an elegant hotel. The place is best reached by car. How long does the picnic last and what happens during it? Golden Afternoon starts at about 12.30 PM (which is after noon!) and lasts until evening – until about 21.30. In that time, apart from traditional picnicing on the grass, all of the event's guests can join the events of the prepared programme. This year apart from the traditional ball dances, joint fashion show and contest for the most elegant gentleman we have also planned a lecture on the history of Kraków's streets, live music and movie screening. More about the programm in the tabs: Programme and Artists. How should one dress and why? Golden Afternoon's aim is to create an illusion of great joint time travel, that is wht EVERYONE has to abide to the specific Dresscode related (more or less) to the 19th-century fashion. We are open to everyone who will put some effort into their copstumes – not only to the q9th-century experts – that is why even the loose inspirations with the clothing and literature of the 19th century are welcome. Can I come as a photographer? That is a question we hear very often. The answer is: yes, but with a few "buts". Most importantly – Golden Afternoon is not an open-air photography workshop. We don't want the experience of "immersion" of our guests into the 19th century to be interrupted by a sight of a semi-professional photoshoot every few steps, taking up most of the event's space. And – what is also crucial – the photographers are also restricted by the dresscode, which should also apply to the cameras they use! Every modern element that makes its way to the Golden Afternoon harms the illusion of time travel, that we try to create and that is the basic goal of the whole game..
More details and news on the event at the Golden Afternoon fanpage on Facebook! Copyright © 2013 Fundacja Nomina Rosae. All rights reserved.